As a gluten-free blogger who is always on the go, I need easy-to-eat snacks that can hold me over until the next safe meal I can find. These Top 7 gluten-free snack bars will not only keep you full, but they’ll keep your tummy happy. t As a celiac and a gluten-free food blogger, I’m always traveling to different cities for food expos and conferences. I couldn’t survive these long trips — or even a trip to the mall — without my handy stash of gluten-free snack bars. These snack bars have gotten me through layovers at airports full of unsafe food and even through holidays at the in-laws, who didn’t have enough gluten-free snackage available. If you empty out my purse right now, chances are you’ll find all seven of these delicious gluten-free snack bars, which I highly recommend. t Van’s has an entire gluten-free line that ranges from the freezer (with their awesome GF waffles) to the pantry (with their GF cereal) and now to my stomach — with their newest PB&J snack bars. They offer strawberry and blueberry versions of their PB&J snack bars, which are packed with whole-grain oats and peanut butter at only 160 calories. Although they have only 3 grams of protein per bar, they make a great, sweet and tasty snack or substitute for a PB&J on the go (VansFoods.com, no pricing info available). tThese peanut-based bars are packed full of protein (12 grams) but are soft and delicious and will satisfy your taste buds. With four flavors — peanut butter, chocolate peanut butter, cranberry toasted almond and oatmeal raisin — there’s enough variety to keep you interested in more than just the peanuts. They’re also non-GMO as well as certified gluten-free, soy-free and vegan — meaning they appeal to more than just us gluten-free customers (TheGlutenFreeBar.com, $28). t Enjoy Life Foods has products that are Top 8 Allergen-Free, which means that they’re safe for not only celiacs and those who eat gluten-free but also for those who are dairy-free and soy-free. While Enjoy Life has an amazing abundance of safe products, their newest bars — the Decadent Bars — re-create amazing, yummy desserts while using safe ingredients. In bar form, you can indulge in these flavors: Cherry Cobbler, Chocolate SunButter, Cinnamon Bun and S’mores! While these bars lack protein to keep you full, they will make your mouth smile, and they are all non-GMO (EnjoyLifeFoods.com, starting at $20). tKIND Healthy Snacks has always been a leader in gluten-free bars, and it focuses on simple combinations that keep you full using the power of protein-filled nuts. Lately, KIND has been coming out with some radical new flavor combinations — like dark chocolate chili almond — that have the celiac community talking. My favorite flavors are peanut butter dark chocolate, dark chocolate cinnamon pecan, peanut butter & strawberry (tastes just like a PB&J!) and almond walnut macadamia nut. I love supporting KIND as a company because it has always focused on doing the KIND thing and spreading random acts of KINDness — staying true to the brand by doing awesome things for the community. Plus, these bars are readily available at many stores, making it easy for a gluten-free girl to chow down (KINDSnacks.com, prices vary). 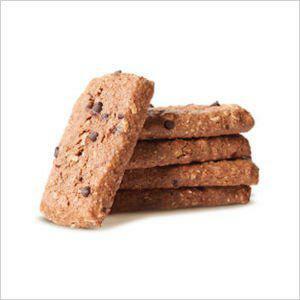 tLARABAR prides itself on making pure and simple bars that are gluten-free, non-GMO and made using minimal ingredients. Many of the bars are also dairy-free, except for those great chocolate chip bars like Chocolate Chip Cookie Dough or Chocolate Chip Brownie. LARABAR has an insane variety of treatlike flavors, ranging from carrot cake to blueberry muffin to pumpkin pie. Typically, each bar has less than 200 calories (LARABAR.com, starting at $2). t Pamela’s Products is another great gluten-free company that makes several lines of products, from flour mixes to cookies to these great Whenever Bars. Just like the name says, these are great for whenever, as they are sweet to satisfy chocolate cravings but also full of gluten-free oats that will keep you full. With about 2 grams of protein and 180 calories, one of these bars will fill you up with oats more than with its protein content, but it still makes for a great snack. Oat Chocolate Chip Coconut is my favorite flavor because I think coconut and chocolate chips are a great pairing for any product (PamelasProducts.com, starting at $27). t Bakery on Main has a full line of granola bars and snack bars, but by far, my favorite bars are the Truebars. These are no-nonsense, minimal-ingredient soft bars in fun flavors. My favorites are the Walnut Cappuccino and the Hazelnut Chocolate Cherry bars. They are made with low-GI, GMO-free and casein-free ingredients, and they have about 3 grams of protein and less than 200 calories per bar (BakeryonMain.com, starting at $2). t Note: Some of these bars have been provided to me for free to review. However, that does not affect my endorsement of the products.